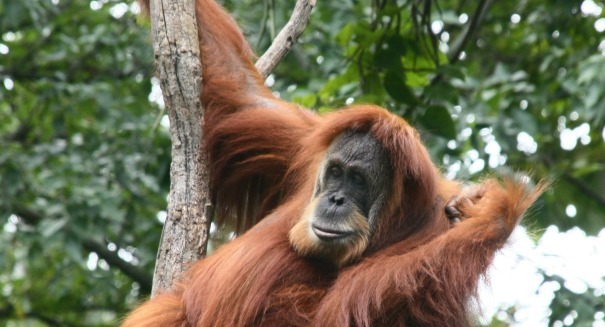 A new survey has found double the number of orangutans as the last survey. A new survey has discovered a huge amount of orangutans missed by past surveys because they were in strange places that scientists never expected they’d be able to survive in. The survey now says there are 14,600 Sumatran orangutans, more than double what the last survey had totaled, according to a German Centre for Integrative Biodiversity Research statement. The last survey counted 6,600 orangutans in 2004. Scientists don’t think that Sumatran orangutans suddenly doubled in size. More likely, past surveys had likely simply missed them. The species is still threatened by habitat loss and poaching, but at least the population is larger than had been thought. The Sumatran orangutan is special because it is Asia’s only great ape. However, it exists only on the islands of Borneo and Sumatra in Southeast Asia, meaning that any upset in those habitats is likely to adversely affect them. So where were these other Sumatran orangutans hiding? The scientists found them in places where they never thought to look, thinking that they wouldn’t be able to live there, such as higher altitudes of the mountains and in forests that had been logged but were in recovery mode. Asia’s only great ape? What happen to all the Homosapiens? Did everbody move out of Asia recently? Wait till they go to meet their maker. This will be the shocker to end all shockers.